After experimenting for several years with various forms of camouflage, my curiosity about the Ghillie style of camouflage got the better of me. With much study of the subject under my belt, I finally decided to try my hand at making some Ghillie camouflage. While users praise its excellent potential for camouflage, they also grumble about its weight and excess warmth. New lightweight synthetic fiber Ghillies have helped alleviate the weight issue. To minimize the heat issue, some commercial suits are made on a "shirt and pants" base made from fine netting, something like mosquito netting, which allows for greater air flow. Although these solutions help, the fact is that any extra layer of clothing will add heat, no matter what it's made of. I decided to take a stab at making my own using some "ventilation" ideas to see how much that might help. I also wanted to create something that would best suit my wildlife photography needs instead of purchasing something designed for military sniping, bow or rifle hunting, or paintball sport. First on my list was deciding what form and style of Ghillie to make. For bird and wildlife photography, any of the forms or styles of Ghillie suits may serve for photographic purposes, depending upon the style of photography being employed. There are many variations on the Ghillie. The following table explains the differences, advantages and disadvantages of the basic styles and forms from which all the variations are created. For the photographer who lives for those low angle shots, two options look best. (1) The Sniper styles of suit may serve well for those who do a lot of crawling with a "ground pod" for example. The jumpsuit version, since it's a closed one-piece affair, has less tendency to collect debri at the waist than the two piece version. (2) For those who tend to lie in wait in a prone position, the blanket form will do well. On the other hand, photographers using tripods and moving from location to location would benefit more from the two Hunter styles, the Poncho, or the Bush Rag forms of Ghillies. For my own needs I decided on a couple of "Hunter" style two-piece suits, and perhaps a blanket as well if I had enough materials left over. A rectangular shape used as an overall cover. Not suitable for movement and mobility. More coverage but warmer than smaller Bush Rag. 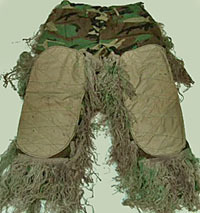 Style 1 - Sniper (for crawling) - Back of shirt and pants are covered with shaggy camouflage threads. The shirt chest and front of pants are covered with heavy duty padded patches to provide protection and durability for crawling. Front patch areas may be camo colored and made of waterproof material, but have no shaggy camo threads to avoid drag and snagging. Style1 - Sniper (for crawling) - Back of jump suit is covered with shaggy camouflage threads. The chest and leg fronts are covered with heavy duty padded patches to provide protection and durability for crawling. Front patch areas may be camo colored and made of waterproof material, but have no shaggy camo threads to avoid drag and snagging. Conventional poncho style of "blanket" draping over the arms and body with a hole for the head. Sides my or may not be gathered and closed under the arms to form "sleeves". Most effective when used with a hood or other head cover. Essentially a small blanket draped like a shawl over the back, shoulders and head to serve also as a hood. Can also be used like a small blanket as an equipment cover. Best suited for stationary camouflage, thrown over one's self and/or tripod and camera. Inconvenient for mobility, requiring folding and carrying, or grasping and holding in place, when moving between locations. A blanket style of the right dimensions, with the addition of a hole cut for the head, can serve double duty as a poncho style. Style 2 - Hunter (for walking) - Sometimes called a "Yeti", both the front and back of shirt and pants are covered in shaggy camouflage threads. Bow hunting versions have no threads in some arm and chest areas to avoid snagging on the bow string. Style 2 - Hunter (for walking) - Sometimes called a "Yeti", the jumpsuit is fully covered, both front and back, by shaggy camouflage threads. Bow hunting versions have no threads in some arm and chest areas to avoid snagging on the bow string. Making a Ghillie involves attaching sections of netting to a base material (shirt and pants in my case), then tying bunches of heavy thread or strips of cut material to the netting to form a shaggy appearance. The Base: The chosen style and form of suit dictates the base to which your camouflage will be attached. For me the shirt/pants "hunter" style seemed suitable. Most commercial Ghillies built on a pants and shirt base are made on rugged military BDUs (Battle Dress Uniforms). After some looking, I came across two pairs of cotton pants and two cotton shirts in dark green and black from a local Goodwill store at $3.75 each, for a total of $15.00. This was much cheaper than buying camouflage BDUs, even used ones from the military surplus, which would have cost at least four or five times more. If you're lucky you might even find BDUs at Goodwill in your size, but I had no such luck. In any event, the dark solid colors hopefully would serve just as well as would camouflaged material for the hunter style I'm making. The shirts were size XXL (I wear medium to large) and the pants are well oversized too. I would be wearing these over other clothing - most often in fall and winter over heavier coats. At other times I would likely be wearing a jacket or vest under the Ghillie, with pockets bulging with lenses, gloves, batteries and other items. The oversized clothes should provide extra air space inside, and hopefully increase air flow and help keep me cooler, which is a top concern. I learned from previous camouflage projects that such oversized clothing works well in these instances. The Netting: I had absolutely no luck at all finding netting locally. I ended up buying mine online, ordering hopefully enough for two suits and a large blanket, probably with left-overs to make small wraps for equipment. 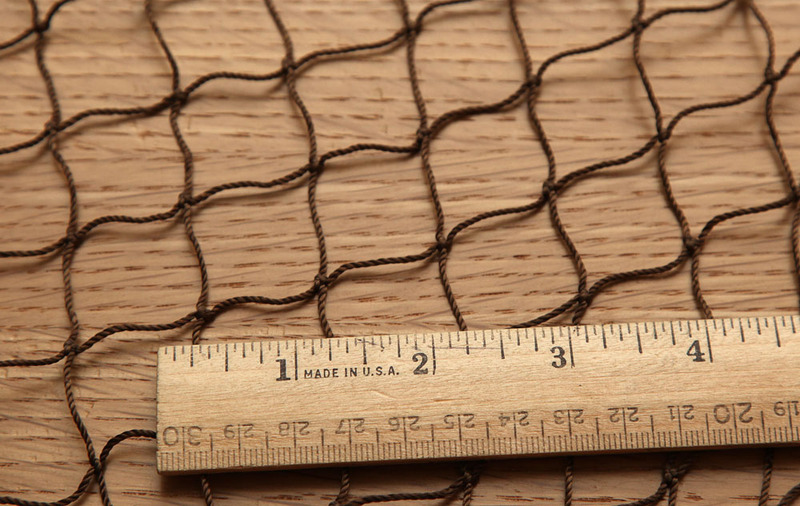 The best netting to use is nylon netting, with squares ranging from 1-inch to 2-inches. Black or an earthy color netting blends better into the camouflage. I ordered 5'x9' nets in brown nylon with 1-inch squares. Companies who make and sell Ghillies with synthetic thread claim it is lighter in weight and more water repellant, however synthetics may have a distinct sheen to them. Burlap and jute is said to weigh more and wicks water like a sponge, with the weight problem being amplified when it gets wet. All of it is flammable, with synthetic perhaps being less so. 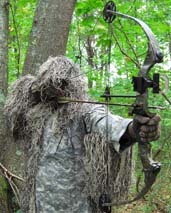 In any event, most commercial Ghillie suits and kits of jute or burlap to make your own suits are already treated with fire retardant, or at least come with some you can apply yourself. Natural jute and burlap must be dyed to gain a selection of colors, using something like "Rit" dye. Burlap cloth can be bought at fabric shops or craft supplies in various pre-dyed colors as well as its "natural" color. This can also be dyed like jute. Bundles of burlap thread, jute thread and synthetic thread can all be purchased online in pre-dyed colors saving the labor of dying and cutting to length. There are even kits containing the netting and select colors of thread to make a suit or blanket. Farm stores, hardware and garden supplies will carry jute thread. Burlap material from fabric stores can be cut, strung and dyed as needed. All of these materials, including synthetic thread, are available online. If you have access to used burlap feed or seed sacks, they can be cut and strung to obtain threads. I had some "natural" and light green burlap cloth on hand from previous projects, and had previously figured out how to easily "string" the material into bundles of thread. I didn't have enough though, and needed more material and more colors. I planned to make one suit in mostly greens and another in tan and light greens to simulate winter grass and weeds. I found rolls of jute twine, but thought it seemed a bit thick compared to the burlap I'd worked with before. I wondered if it would make the suit weigh more than burlap threads. In the end, I ordered synthetic thread online. Other needed items: I would also need some "skrim" netting and some mosquito netting to use for covering cutouts on the shirts to increase air ventilation. 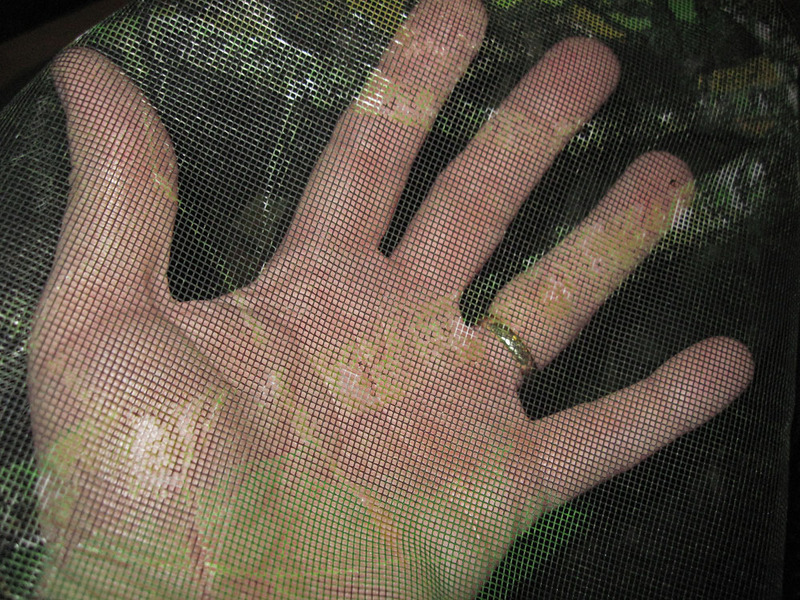 I already had some camouflage mosquito netting on hand, left over from previous projects. 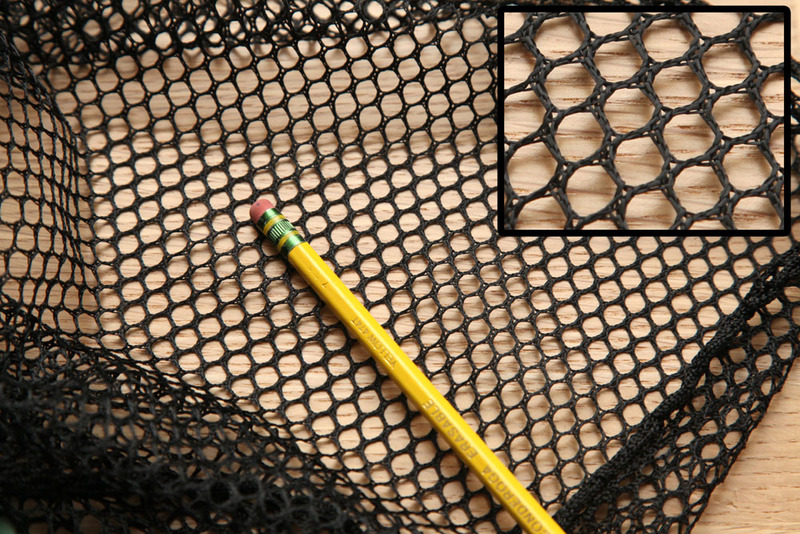 For the skrim netting I found some nylon "cargo netting" at a fabric shop - the kind with round holes I'd seen used for duck decoy bags, laundry bags, and even fishing nets. This is called "sniper mesh" in Ghillie suit jargon, used for ventilation and face veils. I bought 2 yards (by 4' wide), which was more than I really needed for this project. With all the items assembled, the real work begins.